When Terra first said the words “Piñata Cakes,” my eyes kind of glazed over. Maybe it’s because I’m not as heavily in the baking world. Or maybe it’s because Pinterest knows I wouldn’t even consider making such a complicated cake. But I had seriously never seen or heard of a piñata cake! So my thinking was, how do I take this idea and make it easy and effortless enough that even someone like me could do it in the small amount of free time I have? So for this challenge I made cupcakes. I saved some time by using a boxed cake mix and store-bought frosting. Then I spent that time decorating and stuffing these little guys. I found it pretty easy to stuff them. I used a small 1-inch biscuit cutter just because I had one in my set of cutters, but you can really just use a knife. And I found that by pushing down the inside of the cupcake a little, you suddenly had a nice space for some piñata filling! For that filling, M&M’s were a good size and I liked the idea of mixing in some candies/sprinkles for a more festive look. Finally, I added a little food coloring to some coconut for a topping. I secretly hate raw coconut, but I learned this trick of coloring it from my chef friend, Sarah. I knew I’d be bringing these to the nurses at the NICU where my babies were, and coloring coconut was such an easy way to make the cupcakes look brighter and more like the outside of an actual piñata. So even though I’m not a fan of the coconut, I went for it! In the end it was super cute, and I think for a kid’s birthday, it would be awesome and totally do-able. It might be fun to find some other candies that are even smaller, and to experiment with some different fillings. You could also dye the coconut in colors that fit your party theme, rather than doing them in rainbow. In the end, these little cupcakes are the lazy man’s way to a piñata cake! Use the cake mix to make the cupcakes according to the package directions, then allow them to cool fully on a cooling rack. Once the cupcakes are cool, chill them in the refrigerator for at least 30 minutes. While the cupcakes chill, divide the coconut into the same number of food storage bags as colors you are planning to use. 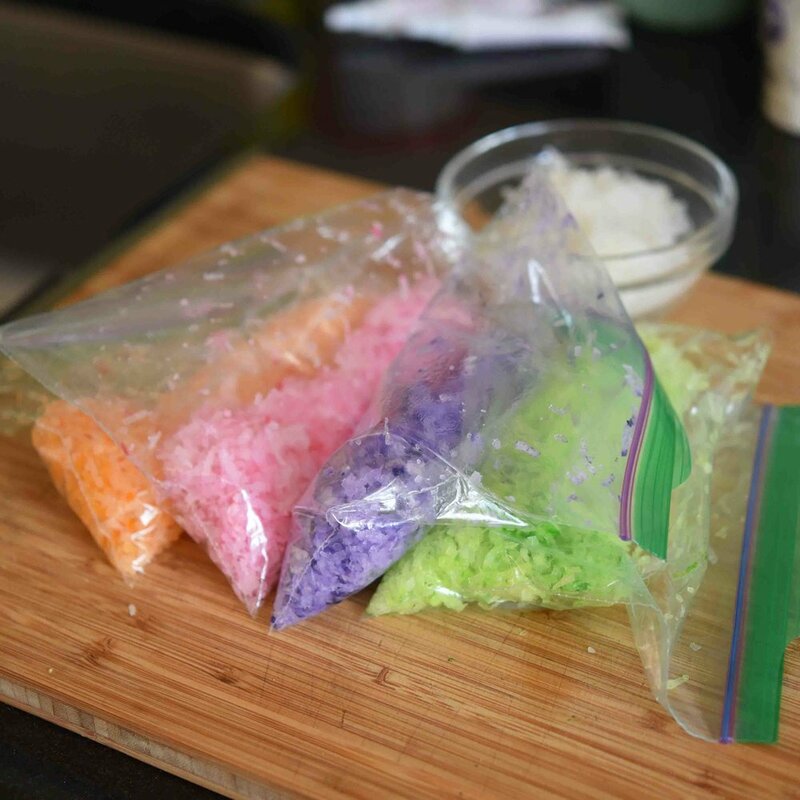 Add a few drops of one color of food coloring to one of the bags, then repeat with the other colors. Shake each bag until the coconut is evenly colored; the amount of food coloring will be different depending on what type you use and what colors you prefer. Once the cupcakes are chilled, use a 1-inch-round biscuit or cookie cutter to cut straight down into the center of each cupcake, coring it. If you don’t have a biscuit cutter, use a paring knife to cut a 1-inch-round hole about ⅔ of the way down into the cupcake. Remove the cored chunk of cake, keeping it in tact, and set it aside for a later use. Use your fingers to compress the cavity in each cupcake, hollowing it out further to fit more candy. Stuff the center of each cupcake with about 1 heaping tablespoon of candy and sprinkles; the cupcakes should be filled until the candy reaches about ½ inch from the top of the cavity. Place the top of each cupcake back on over the candy, pressing down until the cupcakes are closed again. Scoop about 1½ tablespoons of frosting onto each cupcake and spread the frosting to cover the top of the cupcake; the frosting doesn’t have to “be pretty,” but should function to help seal the top of the cupcake back together and be thick enough for the coconut to stick in the next step. Sprinkle the colored coconut onto the frosted cupcakes, using fun patterns (like stripes or polka dots), or just mix it all up! Store in the fridge if the frosting starts to get too soft.